© REUTERS/Albert Gea The Open Arms rescue boat, run by the Spanish Proactiva Open Arms charity, arrives to port in Barcelona. 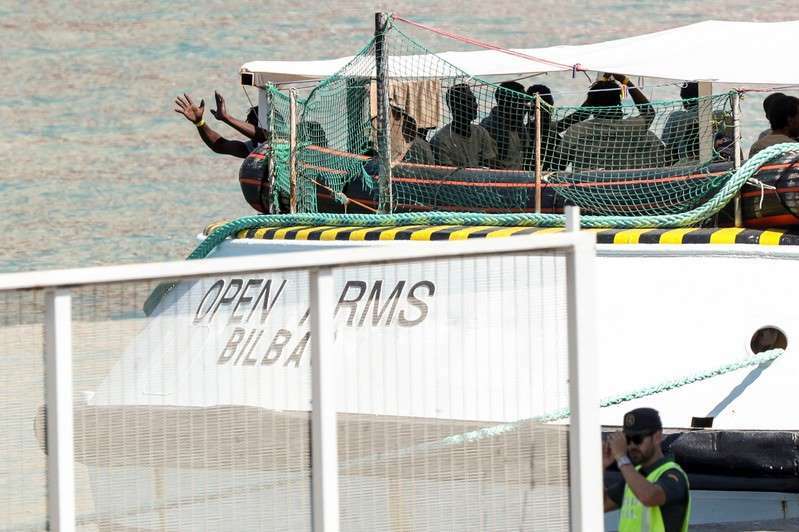 Spain's new Socialist prime minister, Pedro Sanchez, had offered for the second time in a month to take in migrants rejected by Italy and Malta, which where both closer. In a video tweeted by a crew member, men, women and children sang and cheered as the rescue ship Open Arms, operated by the Spanish charity ProActiva Open Arms, arrived in Barcelona's busy port to dock alongside cruise and cargo ships. Barcelona mayor Ada Colau tweeted that Wednesday's arrivals "could have died, but they are alive." "This is the Mediterranean Sea and the Europe we want, where life is celebrated and protected," she added. Most Spaniards are in favor of welcoming and helping to integrate refugees, and feel that their previous, conservative government did not do enough, pollsters say.